When you travel away from home with your cat, she needs somewhere to take care of litter box business. 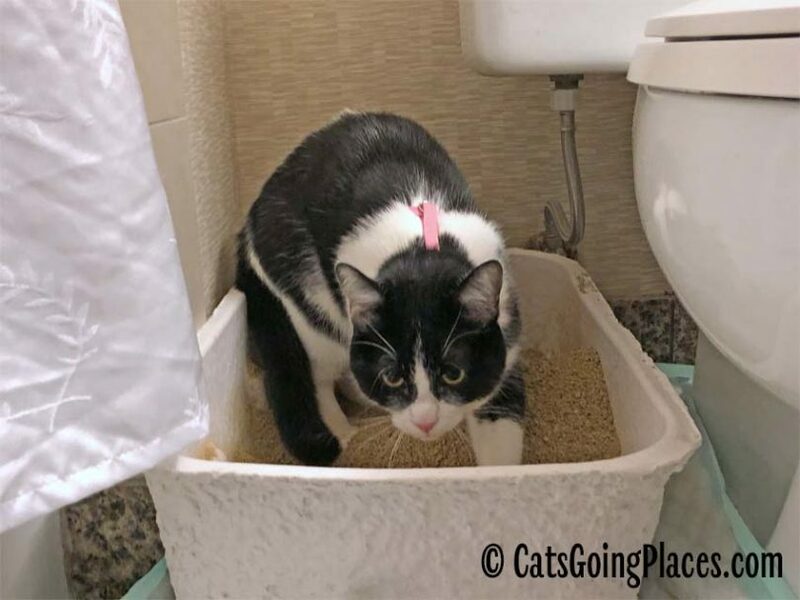 Unless you have a cat you can walk like a dog, this means arranging for a litter box in your hotel room. I recently stayed in a hotel room with Cupcake and her sister, Chanel. Both of them use different types of litter at home. So we arranged for two different litter boxes, one with each litter type. 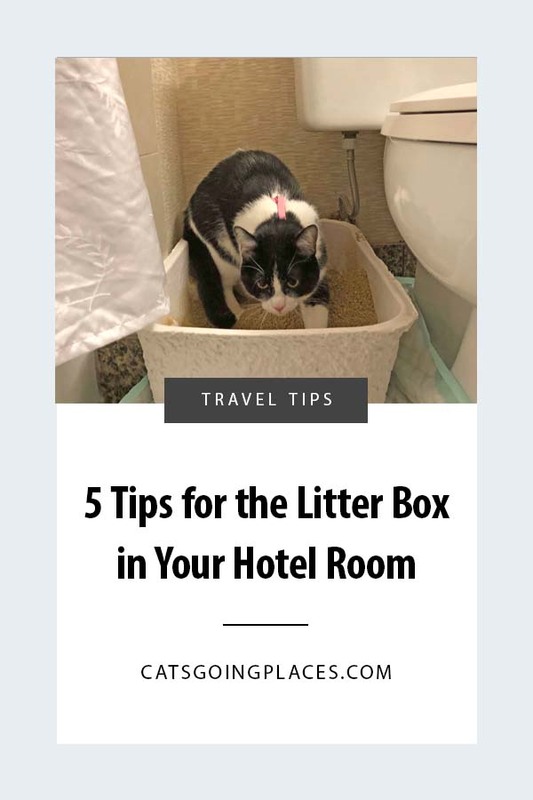 With cats already feeling stressed out about being away from home, it was better to be sure each one had the litter they were familiar with than to worry about whether unfamiliar litter could lead to bad litter box habits in a hotel room. You probably won’t be able to travel with an actual litter mat, but puppy pads can help prevent cat litter from tracking across the tile floor. 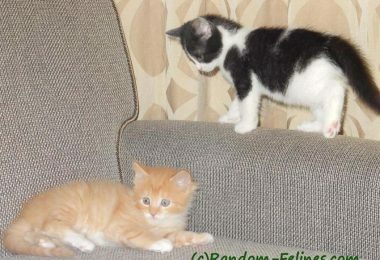 We used an incontinence pad in front of one litter box and a towel in front of the other. The towel collected more litter than the incontinence pad during our stay. I’m not sure whether this was caused by the cats both using the clay litter more often than the corn litter, or whether it actually trapped more litter per step. Either way, both are useful choices in minimizing litter scatter throughout your hotel room during your stay. Another lesson I learned was that clay litter and wet paws don’t mix. We had a slow drip in our bathtub faucet even when it was turned all the way off. This wouldn’t be a problem for most people with cats, but both Cupcake and Chanel love to play in water. When the clumping clay litter was right next to the tub, it was easy for the cats to play with the dripping tap and then jump directly from the tub into the litter box. 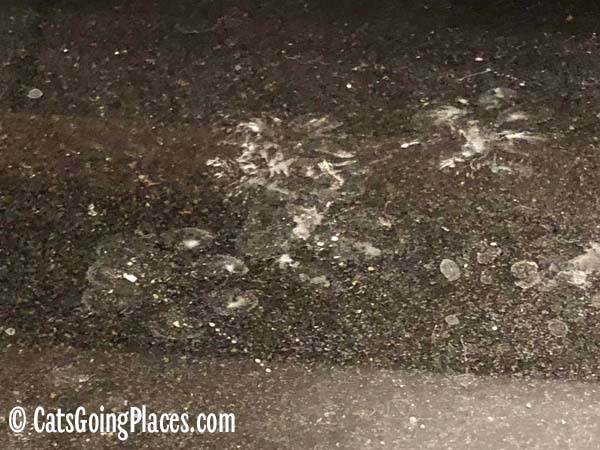 The black stone counter top was covered with white paw prints within 24 hours. 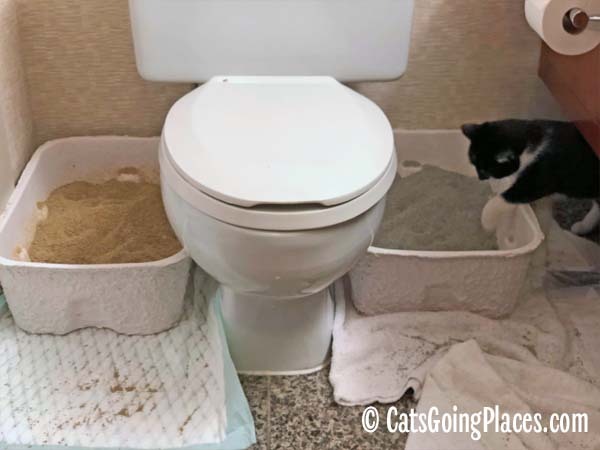 To minimize this issue, we swapped location of the two litter boxes, so the corn-based litter was next to the tub and the clay litter was on the far side of the toilet from it. This slowed the accumulation of white footprints considerably. I also didn’t see Cupcake grooming any more globs of clumped clay litter off of her feet after moving the clay litter farther from the water source. If you scoop your litter once or twice a day, the waste adds up. During an extended stay at a hotel, this can add become quite a volume of waste, especially when you use a Do Not Disturb sign so housekeeping can’t carry the bag away for you. There’s no delicate way to say it, the smell of cat litter waste is powerful stuff, and it can eventually permeate through the plastic of a bag if you leave it sitting around waiting for the next scoop. 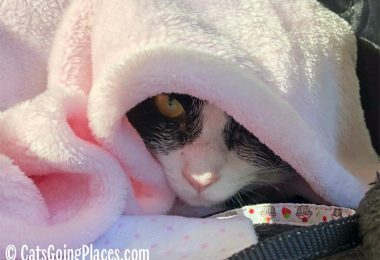 For this past trip, I tried something new for containing cat litter, and I’m going to share an affiliate link to it because it worked like a charm: Base CampSource odor barrier bags. These bags are intended to contain scents of their contents so campers can safely store their food without bears smelling it. I figured if a bear can’t smell through the plastic, neither could I, and it turned out I was right! Using one bag for the entire five-day trip, the only time I smelled litter stored in the bag at all was when I unclipped it to add litter at scooping time. You can see Cupcake in the photo above had reaction to the bag full of waste because it didn’t have a smell. The bag worked like magic. As long as the litter was scooped and stored in it, your nose would never have known there were cats staying in our room. The package I bought had five bags, so I’m all set for dirty litter storage at the next four trips Cupcake and I take together. 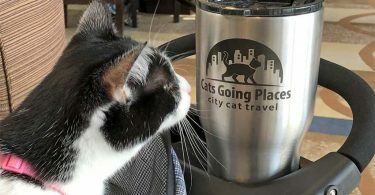 It’s up to those of us with cats who go places to make sure our cats stay welcome in the hotels where we visit. That means tidying up before we leave so housekeeping doesn’t complain about the extra work cats cause. Honestly, cleaning up enough to prevent housekeeping from having too much extra work wasn’t hard. I dampened a washcloth and wiped down the counter top. You can scroll back up to the photo of the paw prints on the counter top to see what the surface looked like before I spent less than a minute wiping it off. We also made sure both litter boxes were bagged and ready for housekeeping to pick up. 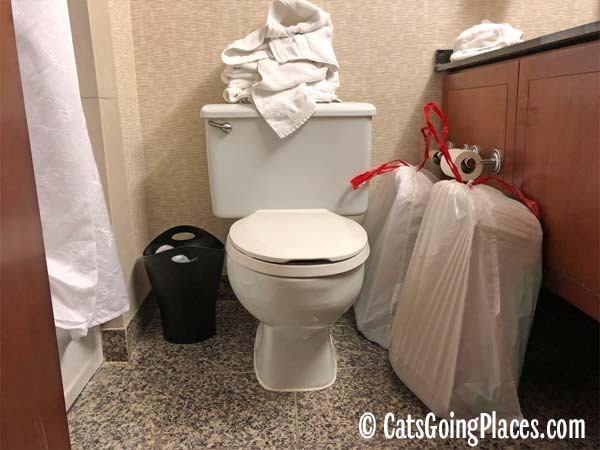 It was simple to shake out the towels that had prevented the litter from tracking into the trash bags and then pile the towels up so housekeeping can pick them up to be washed. 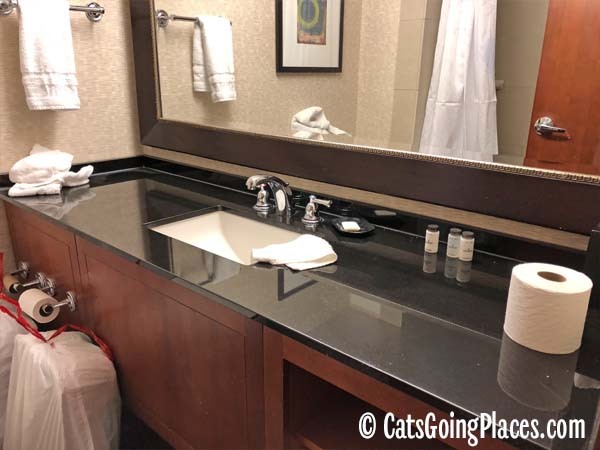 It really doesn’t take a lot of extra effort to keep both cats and housekeeping happy with the arrangements for a litter box in your you hotel room. This post contains affiliate links, which means we receive a small percentage if you make a purchase using the link on this page. The odor barrier bag tip is great! My human usually bags up the waste in a doggie bag and disposes of it every day, but your idea is even better. 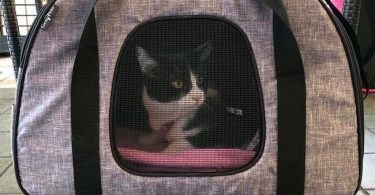 We actually used the litter mat that came in the swag bag for my litter box, and it worked so well that we brought it to the Pet Expo. We too are serious cleaner-uppers when we are checking out. My human actually took the disposable litter box to the outside trash downstairs to dispose of mine. These are great tips! We don’t travel, but you never know when we may need to go to a hotel. Totally going to look into those bags. I usually bring doggie poops bags and throw it in an outside garbage can each day. I don’t usually even leave the litter boxes for anyone to deal with, I just take them and find a dumpster somewhere.  It is so hard to find cat friendly hotels I want to be as good as I can! I bring a sweeper broom too, I think I got it at the dollar tree. I keep it in my show bag to clean up messes in the show hall, but it works in the hotel room too. That’s a good question! Cupcake is trained to use the litter box before we leave. She is regularly on outings for four hours after that with no problems. I wrote about how I taught her to “to before we leave” here, if you’re interested in reading more: https://catsgoingplaces.com/using-the-litter-box-before-cat-travel/. 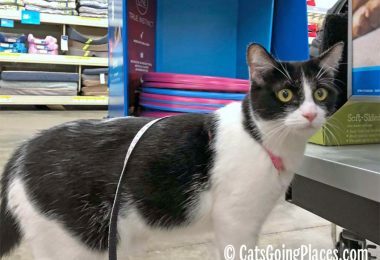 For longer outings, like overnight, I would definitely bring a litter box of some kind so your cat has somewhere to take care of business while you’re there. Additionally, if your outings take you outdoors, many cats figure out the grass or dirt is what their outdoor cousins use. 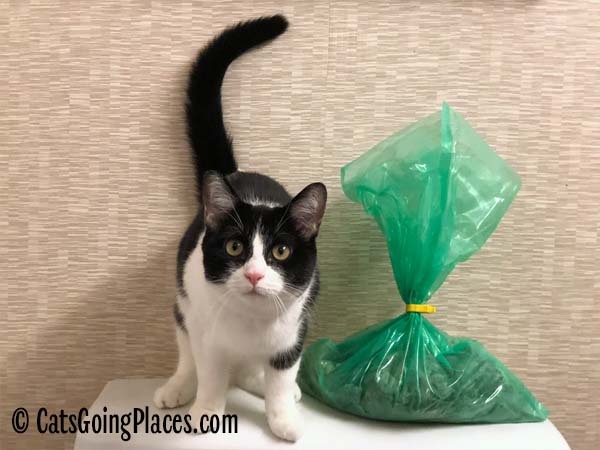 It’s a good idea to have a bag of some kind tucked away in case you have to clean up after your cat takes advantage of a lawn or flower bed.